For fantastic softness and support from your futon, in both the upright seating position, as well as folded flat as a bed, Foam Factory, Inc.'s Foam Futon Pad is luxurious and resilient, but most importantly, it's incredibly comfortable! Most futons come with bare-bone, thinly-stuffed fiber cushions that compress quickly, leaving you feeling each and every rung in your futon's frame. With our Foam Futon Pad, you get dual-material construction, designed to provide long-term support in either usage position, while providing comfort for years of rest and relaxation. 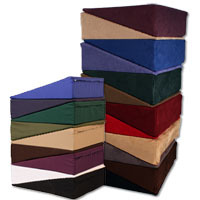 The 6" Foam Futon Pad is made from two 4" HD36 High Quality foam cores, with a double wrapping of 1" Dacron fiberfill. Each cushion core is wrapped individually once, and wrapped a second time, together. This produces a cushion that is neither too soft nor too firm, with a plush outer fiberfill layer that doesn't diminish support. This "hinged" construction design also helps avoid the creasing you would get in a solid piece of foam. Over time, those creases can lead to premature wear and will be uncomfortable for anyone using the futon. Upgrade your futon with Foam Factory, Inc.'s Foam Futon Pad, and get comfort you didn't know was possible from your favorite piece of furniture!